For various definitions of distance in cosmology, see Distance measures (cosmology). The ladder analogy arises because no single technique can measure distances at all ranges encountered in astronomy. Instead, one method can be used to measure nearby distances, a second can be used to measure nearby to intermediate distances, and so on. Each rung of the ladder provides information that can be used to determine the distances at the next higher rung. Statue of an astronomer and the concept of the cosmic distance ladder by the parallax method, made from the azimuth ring and other parts of the Yale–Columbia Refractor (telescope) (c 1925) wrecked by the 2003 Canberra bushfires which burned out the Mount Stromlo Observatory; at Questacon, Canberra, Australian Capital Territory. At the base of the ladder are fundamental distance measurements, in which distances are determined directly, with no physical assumptions about the nature of the object in question. The precise measurement of stellar positions is part of the discipline of astrometry. Direct distance measurements are based upon the astronomical unit (AU), which is the distance between the Earth and the Sun. Kepler's laws provide precise ratios of the sizes of the orbits of objects orbiting the Sun, but provides no measurement of the overall scale of the orbit system. Radar is used to measure the distance between the orbits of the Earth and of a second body. From that measurement and the ratio of the two orbit sizes, the size of Earth's orbit is calculated. The Earth's orbit is known with an absolute precision of a few meters and a relative precision of a few 6989100000000000000♠1×10−11. Historically, observations of transits of Venus were crucial in determining the AU; in the first half of the 20th century, observations of asteroids were also important. Presently the orbit of Earth is determined with high precision using radar measurements of distances to Venus and other nearby planets and asteroids, and by tracking interplanetary spacecraft in their orbits around the Sun through the Solar System. Stellar parallax motion from annual parallax. Half the apex angle is the parallax angle. The most important fundamental distance measurements come from trigonometric parallax. As the Earth orbits the Sun, the position of nearby stars will appear to shift slightly against the more distant background. These shifts are angles in an isosceles triangle, with 2 AU (the distance between the extreme positions of Earth's orbit around the Sun) making the base leg of the triangle and the distance to the star being the long equal length legs. The amount of shift is quite small, measuring 1 arcsecond for an object at 1 parsec's distance (3.26 light-years) of the nearest stars, and thereafter decreasing in angular amount as the distance increases. Astronomers usually express distances in units of parsecs (parallax arcseconds); light-years are used in popular media. Because parallax becomes smaller for a greater stellar distance, useful distances can be measured only for stars which are near enough to have a parallax larger than a few times the precision of the measurement. In the 1990s, for example, the Hipparcos mission obtained parallaxes for over a hundred thousand stars with a precision of about a milliarcsecond, providing useful distances for stars out to a few hundred parsecs. The Hubble telescope WFC3 now has the potential to provide a precision of 20 to 40 microarcseconds, enabling reliable distance measurements up to 5,000 parsecs (16,000 ly) for small numbers of stars. In 2018, Data Release 2 from the Gaia space mission provides similarly accurate distances to most stars brighter than 15th magnitude. Stars have a velocity relative to the Sun that causes proper motion (transverse across the sky) and radial velocity (motion toward or away from the Sun). The former is determined by plotting the changing position of the stars over many years, while the latter comes from measuring the Doppler shift of the star's spectrum caused by motion along the line of sight. For a group of stars with the same spectral class and a similar magnitude range, a mean parallax can be derived from statistical analysis of the proper motions relative to their radial velocities. This statistical parallax method is useful for measuring the distances of bright stars beyond 50 parsecs and giant variable stars, including Cepheids and the RR Lyrae variables. Parallax measurements may be an important clue to understanding three of the universe's most elusive components: dark matter, dark energy and neutrinos. The motion of the Sun through space provides a longer baseline that will increase the accuracy of parallax measurements, known as secular parallax. For stars in the Milky Way disk, this corresponds to a mean baseline of 4 AU per year, while for halo stars the baseline is 40 AU per year. After several decades, the baseline can be orders of magnitude greater than the Earth–Sun baseline used for traditional parallax. However, secular parallax introduces a higher level of uncertainty because the relative velocity of observed stars is an additional unknown. When applied to samples of multiple stars, the uncertainty can be reduced; the uncertainty is inversely proportional to the square root of the sample size. Moving cluster parallax is a technique where the motions of individual stars in a nearby star cluster can be used to find the distance to the cluster. Only open clusters are near enough for this technique to be useful. In particular the distance obtained for the Hyades has historically been an important step in the distance ladder. Other individual objects can have fundamental distance estimates made for them under special circumstances. If the expansion of a gas cloud, like a supernova remnant or planetary nebula, can be observed over time, then an expansion parallax distance to that cloud can be estimated. Those measurements however suffer from uncertainties in the deviation of the object from sphericity. Binary stars which are both visual and spectroscopic binaries also can have their distance estimated by similar means, and don't suffer from the above geometric uncertainty. The common characteristic to these methods is that a measurement of angular motion is combined with a measurement of the absolute velocity (usually obtained via the Doppler effect). The distance estimate comes from computing how far the object must be to make its observed absolute velocity appear with the observed angular motion. Expansion parallaxes in particular can give fundamental distance estimates for objects that are very far, because supernova ejecta have large expansion velocities and large sizes (compared to stars). Further, they can be observed with radio interferometers which can measure very small angular motions. These combine to provide fundamental distance estimates to supernovae in other galaxies. Though valuable, such cases are quite rare, so they serve as important consistency checks on the distance ladder rather than workhorse steps by themselves. Almost all astronomical objects used as physical distance indicators belong to a class that has a known brightness. By comparing this known luminosity to an object's observed brightness, the distance to the object can be computed using the inverse-square law. These objects of known brightness are termed standard candles, coined by Henrietta Swan Leavitt. where m is the apparent magnitude and M the absolute magnitude. For this to be accurate, both magnitudes must be in the same frequency band and there can be no relative motion in the radial direction. Some means of correcting for interstellar extinction, which also makes objects appear fainter and more red, is needed, especially if the object lies within a dusty or gaseous region. The difference between an object's absolute and apparent magnitudes is called its distance modulus, and astronomical distances, especially intergalactic ones, are sometimes tabulated in this way. Two problems exist for any class of standard candle. The principal one is calibration, that is the determination of exactly what the absolute magnitude of the candle is. This includes defining the class well enough that members can be recognized, and finding enough members of that class with well-known distances to allow their true absolute magnitude to be determined with enough accuracy. The second problem lies in recognizing members of the class, and not mistakenly using a standard candle calibration on an object which does not belong to the class. At extreme distances, which is where one most wishes to use a distance indicator, this recognition problem can be quite serious. That this is not merely a philosophical issue can be seen from the history of distance measurements using Cepheid variables. In the 1950s, Walter Baade discovered that the nearby Cepheid variables used to calibrate the standard candle were of a different type than the ones used to measure distances to nearby galaxies. The nearby Cepheid variables were population I stars with much higher metal content than the distant population II stars. As a result, the population II stars were actually much brighter than believed, and when corrected, this had the effect of doubling the distances to the globular clusters, the nearby galaxies, and the diameter of the Milky Way. Gravitational waves originating from the inspiral phase of compact binary systems, such as neutron stars or black holes, have the useful property that both the amplitude and shape of the emitted gravitational radiation depend strongly on the chirp mass of the system. By observing the waveform, the chirp mass can be computed. With the chirp mass and the measured amplitude, distance to the source can be determined. Further, gravitational waves are not subject to extinction due to an absorbing intervening medium. (They are subject to gravitational lensing, however.) Thus, such a gravitational wave source is a "standard siren" of known loudness. The amplitude and shape of the detected gravitational radiation allows the distance to be computed. Therefore, a standard siren can be used as a distance indicator on a cosmic scale. When the collision can be observed optically as well (in the case of a kilonova such as GW170817), the Doppler shift can be measured and the Hubble constant computed. Another class of physical distance indicator is the standard ruler. In 2008, galaxy diameters have been proposed as a possible standard ruler for cosmological parameter determination. More recently the physical scale imprinted by baryon acoustic oscillations (BAO) in the early universe has been used. In the early universe (before recombination) the baryons and photons scatter off each other, and form a tightly-coupled fluid that can support sound waves. The waves are sourced by primordial density perturbations, and travel at speed that can be predicted from the baryon density and other cosmological parameters. The total distance that these sound waves can travel before recombination determines a fixed scale, which simply expands with the universe after recombination. BAO therefore provide a standard ruler that can be measured in galaxy surveys from the effect of baryons on the clustering of galaxies. The method requires an extensive galaxy survey in order to make this scale visible, but has been measured with percent-level precision (see baryon acoustic oscillations). The scale does depend on cosmological parameters like the baryon and matter densities, and the number of neutrinos, so distances based on BAO are more dependent on cosmological model than those based on local measurements. Light echos can be also used as standard rulers, although it is challenging to correctly measure the source geometry. With few exceptions, distances based on direct measurements are available only out to about a thousand parsecs, which is a modest portion of our own Galaxy. For distances beyond that, measures depend upon physical assumptions, that is, the assertion that one recognizes the object in question, and the class of objects is homogeneous enough that its members can be used for meaningful estimation of distance. Eclipsing binaries — In the last decade, measurement of eclipsing binaries' fundamental parameters has become possible with 8-meter class telescopes. This makes it feasible to use them as indicators of distance. Recently, they have been used to give direct distance estimates to the Large Magellanic Cloud (LMC), Small Magellanic Cloud (SMC), Andromeda Galaxy and Triangulum Galaxy. Eclipsing binaries offer a direct method to gauge the distance to galaxies to a new improved 5% level of accuracy which is feasible with current technology to a distance of around 3 Mpc (3 million parsecs). RR Lyrae variables — used for measuring distances within the galaxy and in nearby globular clusters. Tip of the red-giant branch (TRGB) distance indicator. In galactic astronomy, X-ray bursts (thermonuclear flashes on the surface of a neutron star) are used as standard candles. Observations of X-ray burst sometimes show X-ray spectra indicating radius expansion. Therefore, the X-ray flux at the peak of the burst should correspond to Eddington luminosity, which can be calculated once the mass of the neutron star is known (1.5 solar masses is a commonly used assumption). This method allows distance determination of some low-mass X-ray binaries. Low-mass X-ray binaries are very faint in the optical, making their distances extremely difficult to determine. Interstellar masers can be used to derive distances to galactic and some extragalactic objects that have maser emission. Type Ia supernovae that have a very well-determined maximum absolute magnitude as a function of the shape of their light curve and are useful in determining extragalactic distances up to a few hundred Mpc. 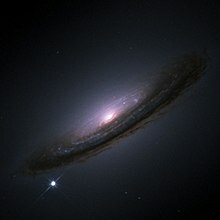 A notable exception is SN 2003fg, the "Champagne Supernova", a Type Ia supernova of unusual nature. When the absolute magnitude for a group of stars is plotted against the spectral classification of the star, in a Hertzsprung–Russell diagram, evolutionary patterns are found that relate to the mass, age and composition of the star. In particular, during their hydrogen burning period, stars lie along a curve in the diagram called the main sequence. By measuring these properties from a star's spectrum, the position of a main sequence star on the H–R diagram can be determined, and thereby the star's absolute magnitude estimated. A comparison of this value with the apparent magnitude allows the approximate distance to be determined, after correcting for interstellar extinction of the luminosity because of gas and dust. In a gravitationally-bound star cluster such as the Hyades, the stars formed at approximately the same age and lie at the same distance. This allows relatively accurate main sequence fitting, providing both age and distance determination. The extragalactic distance scale is a series of techniques used today by astronomers to determine the distance of cosmological bodies beyond our own galaxy, which are not easily obtained with traditional methods. Some procedures utilize properties of these objects, such as stars, globular clusters, nebulae, and galaxies as a whole. Other methods are based more on the statistics and probabilities of things such as entire galaxy clusters. Discovered in 1956 by Olin Wilson and M.K. Vainu Bappu, the Wilson–Bappu effect utilizes the effect known as spectroscopic parallax. Many stars have features in their spectra, such as the calcium K-line, that indicate their absolute magnitude. The distance to the star can then be calculated from its apparent magnitude using the distance modulus. There are major limitations to this method for finding stellar distances. The calibration of the spectral line strengths has limited accuracy and it requires a correction for interstellar extinction. Though in theory this method has the ability to provide reliable distance calculations to stars up to 7 megaparsecs (Mpc), it is generally only used for stars at hundreds of kiloparsecs (kpc). Several problems complicate the use of Cepheids as standard candles and are actively debated, chief among them are: the nature and linearity of the period-luminosity relation in various passbands and the impact of metallicity on both the zero-point and slope of those relations, and the effects of photometric contamination (blending) and a changing (typically unknown) extinction law on Cepheid distances. These unresolved matters have resulted in cited values for the Hubble constant ranging between 60 km/s/Mpc and 80 km/s/Mpc. Resolving this discrepancy is one of the foremost problems in astronomy since some cosmological parameters of the Universe may be constrained significantly better by supplying a precise value of the Hubble constant. Cepheid variable stars were the key instrument in Edwin Hubble's 1923 conclusion that M31 (Andromeda) was an external galaxy, as opposed to a smaller nebula within the Milky Way. He was able to calculate the distance of M31 to 285 Kpc, today's value being 770 Kpc. As detected thus far, NGC 3370, a spiral galaxy in the constellation Leo, contains the farthest Cepheids yet found at a distance of 29 Mpc. Cepheid variable stars are in no way perfect distance markers: at nearby galaxies they have an error of about 7% and up to a 15% error for the most distant. There are several different methods for which supernovae can be used to measure extragalactic distances. where d is the distance to the supernova, Vej is the supernova's ejecta's radial velocity (it can be assumed that Vej equals Vθ if spherically symmetric). This method works only if the supernova is close enough to be able to measure accurately the photosphere. Similarly, the expanding shell of gas is in fact not perfectly spherical nor a perfect blackbody. Also interstellar extinction can hinder the accurate measurements of the photosphere. This problem is further exacerbated by core-collapse supernova. All of these factors contribute to the distance error of up to 25%. Therefore, when observing a Type Ia supernova, if it is possible to determine what its peak magnitude was, then its distance can be calculated. It is not intrinsically necessary to capture the supernova directly at its peak magnitude; using the multicolor light curve shape method (MLCS), the shape of the light curve (taken at any reasonable time after the initial explosion) is compared to a family of parameterized curves that will determine the absolute magnitude at the maximum brightness. This method also takes into effect interstellar extinction/dimming from dust and gas. Similarly, the stretch method fits the particular supernovae magnitude light curves to a template light curve. This template, as opposed to being several light curves at different wavelengths (MLCS) is just a single light curve that has been stretched (or compressed) in time. By using this Stretch Factor, the peak magnitude can be determined. Using Type Ia supernovae is one of the most accurate methods, particularly since supernova explosions can be visible at great distances (their luminosities rival that of the galaxy in which they are situated), much farther than Cepheid Variables (500 times farther). Much time has been devoted to the refining of this method. The current uncertainty approaches a mere 5%, corresponding to an uncertainty of just 0.1 magnitudes. is the time derivative of the nova's mag, describing the average rate of decline over the first 2 magnitudes. Based on the method of comparing the luminosities of globular clusters (located in galactic halos) from distant galaxies to that of the Virgo Cluster, the globular cluster luminosity function carries an uncertainty of distance of about 20% (or 0.4 magnitudes). US astronomer William Alvin Baum first attempted to use globular clusters to measure distant elliptical galaxies. He compared the brightest globular clusters in Virgo A galaxy with those in Andromeda, assuming the luminosities of the clusters were the same in both. Knowing the distance to Andromeda, Baum has assumed a direct correlation and estimated Virgo A's distance. where m0 is the turnover magnitude, M0 is the magnitude of the Virgo cluster, and sigma is the dispersion ~ 1.4 mag. It is important to remember that it is assumed that globular clusters all have roughly the same luminosities within the universe. There is no universal globular cluster luminosity function that applies to all galaxies. Like the GCLF method, a similar numerical analysis can be used for planetary nebulae (note the use of more than one!) within far off galaxies. The planetary nebula luminosity function (PNLF) was first proposed in the late 1970s by Holland Cole and David Jenner. They suggested that all planetary nebulae might all have similar maximum intrinsic brightness, now calculated to be M = −4.53. This would therefore make them potential standard candles for determining extragalactic distances. Where N(M) is number of planetary nebula, having absolute magnitude M. M* is equal to the nebula with the brightest magnitude. The following method deals with the overall inherent properties of galaxies. These methods, though with varying error percentages, have the ability to make distance estimates beyond 100 Mpc, though it is usually applied more locally. The surface brightness fluctuation (SBF) method takes advantage of the use of CCD cameras on telescopes. Because of spatial fluctuations in a galaxy's surface brightness, some pixels on these cameras will pick up more stars than others. However, as distance increases the picture will become increasingly smoother. Analysis of this describes a magnitude of the pixel-to-pixel variation, which is directly related to a galaxy's distance. Where C is a constant which depends on the distance to the galaxy clusters. This method has the potential to become one of the strongest methods of galactic distance calculators, perhaps exceeding the range of even the Tully–Fisher method. As of today, however, elliptical galaxies aren't bright enough to provide a calibration for this method through the use of techniques such as Cepheids. Instead, calibration is done using more crude methods. A succession of distance indicators, which is the distance ladder, is needed for determining distances to other galaxies. The reason is that objects bright enough to be recognized and measured at such distances are so rare that few or none are present nearby, so there are too few examples close enough with reliable trigonometric parallax to calibrate the indicator. For example, Cepheid variables, one of the best indicators for nearby spiral galaxies, cannot yet be satisfactorily calibrated by parallax alone, though the Gaia space mission is expected to solve that specific problem. The situation is further complicated by the fact that different stellar populations generally do not have all types of stars in them. Cepheids in particular are massive stars, with short lifetimes, so they will only be found in places where stars have very recently been formed. Consequently, because elliptical galaxies usually have long ceased to have large-scale star formation, they will not have Cepheids. Instead, distance indicators whose origins are in an older stellar population (like novae and RR Lyrae variables) must be used. However, RR Lyrae variables are less luminous than Cepheids, and novae are unpredictable and an intensive monitoring program—and luck during that program—is needed to gather enough novae in the target galaxy for a good distance estimate. Because the more distant steps of the cosmic distance ladder depend upon the nearer ones, the more distant steps include the effects of errors in the nearer steps, both systematic and statistical ones. The result of these propagating errors means that distances in astronomy are rarely known to the same level of precision as measurements in the other sciences, and that the precision necessarily is poorer for more distant types of object. Another concern, especially for the very brightest standard candles, is their "standardness": how homogeneous the objects are in their true absolute magnitude. For some of these different standard candles, the homogeneity is based on theories about the formation and evolution of stars and galaxies, and is thus also subject to uncertainties in those aspects. For the most luminous of distance indicators, the Type Ia supernovae, this homogeneity is known to be poor[clarification needed]; however, no other class of object is bright enough to be detected at such large distances, so the class is useful simply because there is no real alternative. 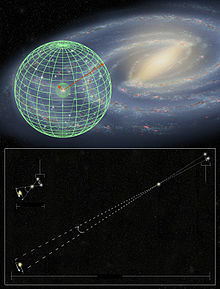 The observational result of Hubble's Law, the proportional relationship between distance and the speed with which a galaxy is moving away from us (usually referred to as redshift) is a product of the cosmic distance ladder. Edwin Hubble observed that fainter galaxies are more redshifted. Finding the value of the Hubble constant was the result of decades of work by many astronomers, both in amassing the measurements of galaxy redshifts and in calibrating the steps of the distance ladder. Hubble's Law is the primary means we have for estimating the distances of quasars and distant galaxies in which individual distance indicators cannot be seen. ^ Ash, M. E.; Shapiro, I. I.; Smith, W. B. (1967). "Astronomical constants and planetary ephemerides deduced from radar and optical observations". The Astronomical Journal. 72: 338. Bibcode:1967AJ.....72..338A. doi:10.1086/110230. ^ Perryman, M. A. C.; et al. (1999). "The HIPPARCOS Catalogue". Astronomy and Astrophysics. 323: L49–L52. Bibcode:1997A&A...323L..49P. ^ Harrington, J. D.; Villard, R. (10 April 2014). "NASA's Hubble Extends Stellar Tape Measure 10 Times Farther Into Space". NASA. Retrieved 17 October 2014. ^ Riess, A. G.; Casertano, S.; Anderson, J.; MacKenty, J.; Filippenko, A. V. (2014). "Parallax Beyond a Kiloparsec from Spatially Scanning the Wide Field Camera 3 on the Hubble Space Telescope". The Astrophysical Journal. 785 (2): 161. arXiv:1401.0484. Bibcode:2014ApJ...785..161R. doi:10.1088/0004-637X/785/2/161. ^ Brown, A. G. A.; et al. (Gaia collaboration) (August 2018). "Gaia Data Release 2: Summary of the contents and survey properties". Astronomy & Astrophysics. 616. A1. arXiv:1804.09365. Bibcode:2018A&A...616A...1G. doi:10.1051/0004-6361/201833051. ^ B., Baidyanath (2003). An Introduction to Astrophysics. PHI Learning Private Limited. ISBN 978-81-203-1121-3. ^ "Hubble finds Universe may be expanding faster than expected". Retrieved 3 June 2016. ^ "Hubble stretches the stellar tape measure ten times further". ESA/Hubble Images. Retrieved April 12, 2014. ^ Popowski, P.; Gould, A. (1998). "Mathematics of Statistical Parallax and the Local Distance Scale". arXiv:astro-ph/9703140. ^ Bartel, N.; et al. (1994). "The shape, expansion rate and distance of supernova 1993J from VLBI measurements". Nature. 368 (6472): 610–613. Bibcode:1994Natur.368..610B. doi:10.1038/368610a0. ^ Fernie, J. D. (December 1969). "The Period-Luminosity Relation: A Historical Review". Publications of the Astronomical Society of the Pacific. 81 (483): 707. Bibcode:1969PASP...81..707F. doi:10.1086/128847. ISSN 0004-6280. ^ "Type Ia Supernova". Weekly Topic. Caglow. Retrieved 30 January 2012. ^ Hendry, Martin; Woan, Graham (February 2007). "Gravitational astrophysics". Astronomy & Geophysics. 48 (1): 1.10–1.17. Bibcode:2007A&G....48a..10H. doi:10.1111/j.1468-4004.2007.48110.x. ^ Abbott, B. P.; et al. (LIGO Scientific Collaboration & Virgo Collaboration) (16 October 2017). "A gravitational-wave standard siren measurement of the Hubble constant". Nature. 551 (7678): 85–88. arXiv:1710.05835. Bibcode:2017Natur.551...85A. doi:10.1038/nature24471. PMID 29094696. ^ Holz, Daniel; Hughes, Scott; Shultz, Bernard (2018). "Measuring cosmic distances with standard sirens". Physics Today. 71 (12): 35–40. Bibcode:2018PhT....71l..34H. doi:10.1063/PT.3.4090. ^ Marinoni, C.; et al. (2008). "Geometrical tests of cosmological models. I. Probing dark energy using the kinematics of high redshift galaxies". Astronomy and Astrophysics. 478 (1): 43–55. arXiv:0710.0759. Bibcode:2008A&A...478...43M. doi:10.1051/0004-6361:20077116. ^ "Light echoes whisper the distance to a star" (Press release). European Southern Observatory. 11 February 2008. Retrieved 2015-10-18. ^ Bond, Howard E.; Sparks, William B. (4 March 2009). "On geometric distance determination to the Cepheid RS Puppis from its light echoes". Astronomy and Astrophysics. 495 (2): 371–377. arXiv:0811.2943. Bibcode:2009A&A...495..371B. doi:10.1051/0004-6361:200810280. We conclude that most of the knots are in fact likely to lie in front of the plane of the sky, thus invalidating the Kervella et al. result. [...] Although the Kervella et al. distance result is invalidated, we show that high-resolution polarimetric imaging has the potential to yield a valid geometric distance to this important Cepheid. ^ Bonanos, A. Z. (2006). "Eclipsing Binaries: Tools for Calibrating the Extragalactic Distance Scale". Proceedings of IAU Symposium. 240: 79–87. arXiv:astro-ph/0610923. Bibcode:2007IAUS..240...79B. CiteSeerX 10.1.1.254.2692. doi:10.1017/S1743921307003845. ^ Ferrarese, L; et al. (2000). "A Database of Cepheid Distance Moduli and Tip of the Red Giant Branch, Globular Cluster Luminosity Function, Planetary Nebula Luminosity Function, and Surface Brightness Fluctuation Data Useful for Distance Determinations". The Astrophysical Journal Supplement Series. 128 (2): 431–459. arXiv:astro-ph/9910501. Bibcode:2000ApJS..128..431F. doi:10.1086/313391. ^ Colgate, S. A. (1979). "Supernovae as a standard candle for cosmology". Astrophysical Journal. 232 (1): 404–408. Bibcode:1979ApJ...232..404C. doi:10.1086/157300. ^ Adapted from George H. Jacoby; David Branch; Robin Ciardullo; Roger L. Davies; William E. Harris; Michael J. Pierce; Christopher J. Pritchet; John L. Tonry; Douglas L. Welch (1992). "A critical review of selected techniques for measuring extragalactic distances". Publications of the Astronomical Society of the Pacific. 104 (678): 599–662. Bibcode:1992PASP..104..599J. doi:10.1086/133035. JSTOR 40679907. ^ Stanek, K. Z.; Udalski, A. (1999). "The Optical Gravitational Lensing Experiment. Investigating the Influence of Blending on the Cepheid Distance Scale with Cepheids in the Large Magellanic Cloud". arXiv:astro-ph/9909346. ^ Udalski, A.; Wyrzykowski, L.; Pietrzynski, G.; Szewczyk, O.; Szymanski, M.; Kubiak, M.; Soszynski, I.; Zebrun, K. (2001). "The Optical Gravitational Lensing Experiment. Cepheids in the Galaxy IC1613: No Dependence of the Period-Luminosity Relation on Metallicity". Acta Astronomica. 51: 221. arXiv:astro-ph/0109446. Bibcode:2001AcA....51..221U. ^ Ngeow, C.; Kanbur, S. M. (2006). "The Hubble Constant from Type Ia Supernovae Calibrated with the Linear and Nonlinear Cepheid Period-Luminosity Relations". The Astrophysical Journal. 642 (1): L29. arXiv:astro-ph/0603643. Bibcode:2006ApJ...642L..29N. doi:10.1086/504478. ^ Macri, L. M.; Stanek, K. Z.; Bersier, D.; Greenhill, L. J.; Reid, M. J. (2006). "A New Cepheid Distance to the Maser–Host Galaxy NGC 4258 and Its Implications for the Hubble Constant". The Astrophysical Journal. 652 (2): 1133–1149. arXiv:astro-ph/0608211. Bibcode:2006ApJ...652.1133M. doi:10.1086/508530. ^ Bono, G.; Caputo, F.; Fiorentino, G.; Marconi, M.; Musella, I. (2008). "Cepheids in External Galaxies. I. The Maser–Host Galaxy NGC 4258 and the Metallicity Dependence of Period–Luminosity and Period–Wesenheit Relations". The Astrophysical Journal. 684 (1): 102. arXiv:0805.1592. Bibcode:2008ApJ...684..102B. doi:10.1086/589965. ^ Majaess, D.; Turner, D.; Lane, D. (2009). "Type II Cepheids as Extragalactic Distance Candles". Acta Astronomica. 59 (4): 403. arXiv:0909.0181. Bibcode:2009AcA....59..403M. ^ Madore, Barry F.; Freedman, Wendy L. (2009). "Concerning the Slope of the Cepheid Period–Luminosity Relation". The Astrophysical Journal. 696 (2): 1498–1501. arXiv:0902.3747. Bibcode:2009ApJ...696.1498M. doi:10.1088/0004-637X/696/2/1498. ^ Scowcroft, V.; Bersier, D.; Mould, J. R.; Wood, P. R. (2009). "The effect of metallicity on Cepheid magnitudes and the distance to M33". Monthly Notices of the Royal Astronomical Society. 396 (3): 43–47. arXiv:0903.4088. Bibcode:2009MNRAS.396.1287S. doi:10.1111/j.1365-2966.2009.14822.x. ^ Majaess, D. (2010). "The Cepheids of Centaurus A (NGC 5128) and Implications for H0". Acta Astronomica. 60 (2): 121. arXiv:1006.2458. Bibcode:2010AcA....60..121M. ^ Tammann, G. A.; Sandage, A.; Reindl, B. (2008). "The expansion field: The value of H 0". Annual Review of Astronomy and Astrophysics. 15 (4): 289. arXiv:0806.3018. Bibcode:2008A&ARv..15..289T. doi:10.1007/s00159-008-0012-y. ^ Freedman, Wendy L.; Madore, Barry F. (2010). "The Hubble Constant". Annual Review of Astronomy and Astrophysics. 48: 673–710. arXiv:1004.1856. Bibcode:2010ARA&A..48..673F. doi:10.1146/annurev-astro-082708-101829. ^ Gilfanov, Marat; Bogdán, Ákos (2010). "An upper limit on the contribution of accreting white dwarfs to the type Ia supernova rate". Nature. 463 (3): 924–925. arXiv:1002.3359. Bibcode:2010Natur.463..924G. doi:10.1038/nature08685. PMID 20164924. Carroll, Bradley W.; Ostlie, Dale A. (2014). An Introduction to Modern Astrophysics. Harlow, United Kingdom: Pearson Education Limited. ISBN 978-1-292-02293-2. Measuring the Universe The Cosmological Distance Ladder, Stephen Webb, copyright 2001. Pasachoff, J.M. ; Filippenko, A. (2013). The Cosmos: Astronomy in the New Millennium (4th ed.). Cambridge: Cambridge University Press. ISBN 978-1-107-68756-1. The Astrophysical Journal, The Globular Cluster Luminosity Function as a Distance Indicator: Dynamical Effects, Ostriker and Gnedin, May 5, 1997. An Introduction to Distance Measurement in Astronomy, Richard de Grijs, Chichester: John Wiley & Sons, 2011, ISBN 978-0-470-51180-0.